Alright I have some data I want to fit using a function I know. This is a dataset of Z values as function of degree, so I make a table for the fit. Now I define the function I want to fit with. Alright let's try to fit. And I'm helping with coefficients very close to what I am looking for. 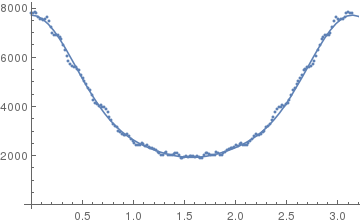 Now, I insists, these coefficients are actually very close to the ones I am looking for, as if the function intensity[t] is plotted while replacing variables by the values provided, it is extremely close. When trying to fit the data with a function A+B*Cos[t], it works (but that's not the function I am looking for). I don't understand the error I have, and why I have it. I understand the function is complex but I am giving good starting parameters. Origin 8 manages to do it quite easily. You need to use a constraint for c to avoid complex numbers. Btw, as a matter of style, I would define all parameters as variables. That way you won't run into troubles if you assign a value to any of these parameters at some point. There are some "identifiability" issues with fitting your model parameters with the data that you have. First, your data set is symmetric in that the first half of the data is identical to the second half so if any standard errors are to be believed, just half of the data needs to be used. @Felix has given you the approach for getting NonlinearModelFit to converge. However, when looking at nlm["CorrelationMatrix"] one sees very large correlations (with some being suspiciously close to 1.0). That correlation matrix looks close to ideal. Not the answer you're looking for? Browse other questions tagged fitting nonlinear or ask your own question.